We’re sorry! This Owner Adventures vacation is now sold out. Please call Bluegreen Travel Services at 800.459.1597 to learn about similar cruises. From $3,379(1)(2) per person, based on double occupancy, Cat. 9: Inside stateroom SOLD OUT! From $3,929(1)(2) per person, based on double occupancy, Cat. 7: Oceanview stateroom (airfare not included) SOLD OUT! From $4,914(1)(2) per person, based on double occupancy, Cat. C2: Concierge Veranda stateroom (airfare not included) SOLD OUT! From $5,114(1)(2) per person, based on double occupancy, Cat. A1: Aqua Class stateroom (airfare not included) SOLD OUT! Single and triple accommodations may be available. Call for rates. Booking deadline is June 5, 2019, or until sold out. Get the details about Autumn’s Glory in New England & Canada by watching our recorded webinar. In just about an hour you’ll discover why you should join us on this 2019 Owner Adventures vacation. If your bucket list includes leaf peeping during the height of the fall season, this is the ideal adventure for you. New England and Canada are famous for their glorious foliage as billions of leaves change from green to a kaleidoscope of yellows, oranges and reds. Sail in modern luxury round-trip from Cape Liberty, New Jersey, aboard the Celebrity Summit, which shimmers with sophistication from bow to stern. Catch a glimpse of the Verrazano-Narrows Bridge, the Statue of Liberty, New York Harbor and all of lower Manhattan as you begin a 14-night, round-trip cruise. See the historic sites of Boston, including Harvard, “Old Ironsides” and the Freedom Trail, on your included, full-day Heritage & Highlights excursion. You’ll even have a light lunch at the Cheers Pub, where “everybody knows your name.” Enjoy free time in the quaint Maine towns of Portland and Bar Harbor, home to Acadia National Park and the granite peak of Cadillac Mountain, the highest point on the East Coast. Arrive in the heart of French Canada at Quebec City, where you will have an overnight stay in port. Learn about the culture of the “People of the Longhouse” during your included Meeting the First Nation of Wendake private group excursion. Hear the stories and share a meal with the Huron-Wendake people who occupy the estuary and valley of the St. Lawrence River. You’ll also see some of Quebec City’s historic sites, including Notre-Dame-des-Victoires, the oldest standing Catholic church in North America. Next visit the Maritime provinces of Prince Edward Island and Nova Scotia. See the sights that inspired the Anne of Green Gables novels and experience the pastoral beauty of idyllic Peggy’s Cove with its iconic lighthouse during your included group excursions before you return to Cape Liberty. This voyage through Canada and New England is sure to be our most colorful Owner Adventures vacation yet! Welcome to your New England and Canada adventure! You will be transferred from the Newark Airport to the cruise port for embarkation on the Celebrity Summit. Sail in modern luxury aboard this recently renovated, Millennium-class ship. As you sail away at 4 p.m., be on the deck to see the Verrazano-Narrows Bridge, the Statue of Liberty, New York Harbor and all of lower Manhattan. Dinner aboard ship; overnight aboard ship. Today is yours to explore your home-away-from-home at sea. Onboard this ship find an amazing array of flavors and a wide selection of restaurants to suit every mood, with menus inspired by and sourced from the regions you will visit. Work out in the fitness center or get pampered in the Canyon Ranch SpaClub. You’ll never lack for entertainment, with energetic, main theater productions and live music, comedy shows and cabaret showcases available nightly. All meals aboard ship; overnight aboard ship. Boston is one of the most historic cities in North America and home to many of the country’s leading universities, historical sights and first-class museums. Today you’ll have a full-day Boston & Cambridge: Heritage & Highlights private group excursion. Start with a stop at Harvard University, founded in 1636. A guide will lead you to the brick halls, famous statuary and green lawns of this historic, elite institution. Pause by the Georgian-style mansion of poet Henry Wadsworth Longfellow along wealthy Tory Row and drive by the first garden-style cemetery in the country, Mount Auburn. Visit the Harvard Museum of Natural History with its collection of 3,000 Glass Flowers and meteorites from outer space. Leave Cambridge and head to Boston’s Back Bay to view the Boston Public Garden, Boston Common and the Cheers Pub of TV sitcom fame. Have a light lunch here before enjoying some free time in Faneuil Hall. Other sights on the tour include the Bunker Hill Monument, USS Constitution (“Old Ironsides”) Old North Church and additional highlights of the Freedom Trail. Your final stop is Mike’s Pastry shop in Boston’s North End, where you will receive Mike’s famous Traditional Cannoli. Breakfast and dinner aboard ship and light lunch on your excursion; overnight aboard ship. You’ll love wandering along the cobblestone walkways and back alleys of the Old Port in Portland, Maine, browsing through galleries and other eclectic shops. Or walk uphill toward the shops of Congress Street, gazing back at the islands of Casco Bay to capture some great photos. You might choose to book an optional excursion here, or take a shuttle or taxi to the L.L. Bean Flagship Store in nearby Freeport, Maine. All meals aboard ship; overnight aboard ship. The list of residents inhabiting this part of Mount Desert Island once read like a who’s who of America’s richest citizens: Rockefeller, Vanderbilt and Carnegie, to name a few. Now anyone can come to Bar Harbor and visit the adjacent Acadia National Park, which offers a network of hiking trails leading to some of the region’s most breathtaking views of the Atlantic Ocean. Book one of the many optional excursions offered here, including carriage tours through the national park and whale-watching cruises. All meals aboard ship; overnight aboard ship. All meals aboard ship; overnight aboard ship. Quebec City, Canada, is one of North America’s oldest and most beautiful settlements. The sense of French provinciality still echoes off the walls of this old city in the language, cuisine and architecture. Your full-day Meeting the First Nation of Wendake private group excursion will help you discover the most French city outside of France. Drive by Place-Royale, a beautifully restored market square of typical 17th- and 18th-century stone architecture in the heart of the Lower Town, which was the site of Samuel de Champlain’s first settlement. It is also the location of the oldest standing Catholic church in North America, Notre-Dame-des-Victoires. Your first stop is in Wendake, where the Huron-Wendat People, also known as the “People of the Longhouse,” live. This nation occupies the estuary and valley of the St. Lawrence River. It was Chief Huron-Wendat Donnacona who welcomed explorer Jacques Cartier to Stadaconé in the 1530s. You’ll have a VIP visit of the Huron-Wendake Museum, which protects and promotes the heritage of the Wendat people, plus an exclusive visit to the local church and a stop at a traditional longhouse for a presentation and storytelling. Continue to La Traite Restaurant and discover dishes inspired by First Nations cuisine, prepared with what has been hunted, fished or gathered. Next make a photo stop at Cap-Diamant, named after the shiny stones explorer Jacques Cartier mistook for diamonds. From here you will have spectacular views of the St. Lawrence River and surrounding countryside. Your final stop is at Dufferin Terrace at Château Frontenac. Located 200 feet above the waterway, it was here that Samuel de Champlain built his fort in 1620. You’ll have free time to explore the area and enjoy views of the St. Lawrence River, Île d’Orléans and the Laurentian Mountains before returning to the ship. Your ship remains in port overnight, so you’ll have plenty of time to see more of Quebec City or experience its nightlife. Breakfast and dinner aboard ship and lunch on your excursion; overnight aboard ship. PLEASE NOTE: This excursion involves moderate walking with some steps and uneven ground. Today is free for you to see Quebec City on your own, or perhaps book an optional excursion. Walk the cobblestone alleyways past stone houses, churches and cafés and admire abandoned military fortifications that at one time helped to hold invading forces at bay. The Old Town is a UNESCO World Heritage site. All meals aboard ship; overnight aboard ship. Nestled in the harbor of the same name, Charlottetown exudes both a nautical charm and a Victorian sensibility. On the south shore of Prince Edward Island, Charlottetown’s red soil adds to the area’s natural beauty. Your full-day Charlottetown & the Land of Anne private group excursion starts with a drive through the capital of Prince Edward Island and past Government House, the official residence of the Lieutenant Governor of the province. Then travel along the coast to the land of Anne of Green Gables. Anne, the central character of the Anne of Green Gables novels, loved the farmland and the friendliness of the people of this area. Follow the Blue Heron Trail through farmland and fishing villages to the seacoast and stop at a fish market to see the catch of the day. Continue on to Prince Edward Island National Park, one of the smallest but most popular of Canada’s national parks. Stop at Green Gables House, which author Lucy Maud Montgomery often visited as a young girl. This farm is believed to have been the primary influence on the setting for her world-famous series of books. In 1937 the house and surrounding farmland became part of Prince Edward Island National Park. Head next to the Prince Edward Island Preserve Company, where you will enjoy lunch with a breathtaking view of the picturesque River Clyde. Your final stop is at Confederation Bridge and Gateway Village. Opened in June 1997, the bridge is one of the world’s longest continuous marine span bridges. There will be time to take pictures and see a multimedia exhibit on Prince Edward Island’s transportation history during a stop in Gateway Village before returning to the ship. Breakfast and dinner aboard ship and lunch on your excursion; overnight aboard ship. The Big Fiddle of Ceilidh, the world’s largest fiddle at 60 feet tall, welcomes you to the port in Sydney. It plays a dedicated medley composed by a local musician and delights all who hear it with a march, a stratespey and a reel. Sydney lies on the coast of Cape Breton Island, which throughout history has served as a melting pot of sorts for the many immigrants who have arrived on Canadian shores, including Acadians, Eastern Europeans, Scotsmen and Africans. Just outside the city environs lies a wealth of sightseeing possibilities, including nature walks, seafaring museums and a Mining Museum where you can take a guided tour of an historic coal mine. Book an optional excursion or explore the city on your own. All meals aboard ship; overnight aboard ship. Located on the shores of the world’s second-largest natural harbor, the “City of Trees” adds to the pastoral beauty of Canada’s maritime region. Board a motorcoach for a full-day Peggy’s Cove & Halifax Highlights private group excursion. It starts with a scenic ride to the idyllic fishing village of Peggy’s Cove, which dates back to 1811. Its year-round population numbers 60. Every season thousands of tourists visit the cove, Lighthouse Point, the gift shops, marine studio, restaurant and church. Get a true taste of Nova Scotia at lunch at the local restaurant before returning to Halifax to spend some free time walking in Halifax’s historic waterfront, where you can explore the eclectic mix of shops and galleries. Continue with a city highlights tour that takes you past St. Paul’s Church, Canada’s oldest Anglican Church; City Hall; the Old Town Clock, built in 1803 to keep the garrison punctual; and Province House. Learn about Halifax’s war years and the heroism of the citizens who lived through the devastating Halifax Explosion of 1917. Head last to the Halifax Citadel, a fortress built in 1858 to protect the city and one of the main ports of entry into British North America. Its hilltop location offers visitors a panoramic view of the harbor and the city. Breakfast and dinner aboard ship and lunch on your excursion; overnight aboard ship. 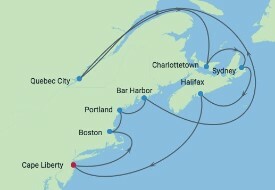 Your New England & Canada adventure ends this morning with disembarkation in Cape Liberty and transfers to the airport. Breakfast is included today. Call 800.459.1597 to Book Our New England & Canada Adventure Today! **BLUEGREEN TRAVEL SERVICES ONBOARD CREDIT OFFER TERMS & CONDITIONS: $50 onboard credit per stateroom available when booked through Bluegreen Travel Services by June 5, 2019. Onboard credit may be used for select purchases aboard the cruise ship and has no cash value. New bookings only. Subject to availability. Terms and conditions apply. Price is per person based on double occupancy and includes Newark Airport transfers on October 6 and 20; 14-night cruise aboard the Celebrity Summit; all meals aboard ship; $50 onboard credit per stateroom; Welcome and Farewell Cocktail Receptions aboard ship; chocolate-covered strawberries delivered to stateroom during cruise; excursions as noted in itinerary; gratuities for tour guides, drivers and cruise staff; and port and security fees and taxes. Onboard credit may be used for select purchases aboard the cruise ship and has no cash value. Offer includes Welcome and Farewell Cocktail Receptions invitations for first and second guests in cabin only. Limit one ticket per paying passenger for included shore excursions. Reservations must be booked by June 5, 2019. Nonrefundable, non-transferrable deposit of $500 per person is due at time of booking. Final payment due by June 5, 2019. Prices, additional fees, itineraries and availability are subject to change without notice. Certain terms, conditions and restrictions may apply. Please call us at 800.459.1597 for additional information. Fares shown are in U.S. dollars for new reservations only and are subject to availability. Not included: airfare, travel insurance, alcohol, beverages, food outside of meals provided aboard ship or on included excursions, specialty dining, optional excursions, baggage fees and all other items of a personal nature. Great Vacation Destinations, doing business as Bluegreen Travel Services, is located at 12400 S. International Drive, Orlando, FL 32821. Great Vacation Destinations is registered with the State of California as a Seller of travel Reg. No. 2068362-50 (registration as a seller of travel does not constitute approval by the State of California); Washington Seller of travel Reg. No. 602-283-711; and registered with the Airlines Reporting Corporation (“ARC”) number 15-72225-4. In the event of a conflict between Celebrity Cruises’ Details of Participation and Great Vacation Destinations’ Details of Participation, Great Vacation Destinations’ Details of Participation shall govern.